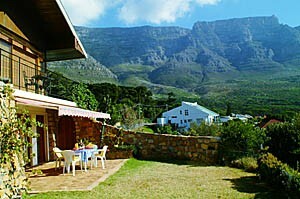 With Table Mountain as its backdrop, the Eagle's Nest offers the relaxed tranquillity of a family home in the suburbs. Backing onto the Table Mountain Nature Reserve the guest house is in close proximity to all the popular tourist attractions and offers breathtaking panoramic views of Table Mountain, Lions Head, Signal Hill, the harbour and Cape Town itself, with Robben Island on the horizon. Fax & photocopy Machine, Wireless Internet, airport shuttle, parking, babysitting, laundry service, braai/barbecue facilities, swimming pool.